A wooden bath-house on a turn –key basis and a sauna are the places where people can sweat and wash themselves with a great pleasure and relax. It is an old good tradition. It is not a secret that the bath- house can be made only of wood despite the fact that nowadays there plenty of other materials. 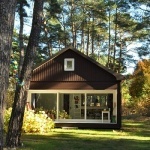 Now it becomes more and more common to build both wooden bath-houses and wooden houses. Wood is the best doctor. The healing properties of the wood give the unique smell to all rooms and create a magical atmosphere of the forest. The natural colors of the wood have a positive impact on the nervous system. Wood is a good air and moisture conductor. 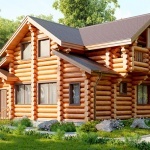 Log bath-houses will have a natural air conditioning which is necessary for the high moisture conditions. There is no any modern air conditioner that is able to face this challenge as wood. Wood breathes, producing heat transfer between the house and the environment. It reaches the highest balance of the air and the moisture. Wood conserves heat. Unlike the brick analogue this material conserves much more heat. The bath-house built by our company allows you to save money on the additional heat. Mounting simplicity. A wooden bath house is built quickly and does not need any additional work with it. And it may be used right after its adjustment. 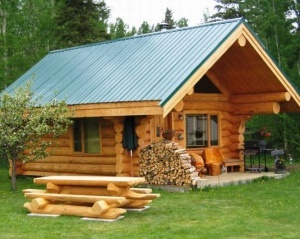 Log bath houses have a great look and are gorgeous. Such building does not need any additional works connected with the surface treatments. You can also take part in the building process and become a designer of your own gorgeous bath house. It is easy to pay. Ecologically pure materials which are processed with all necessary liquids. 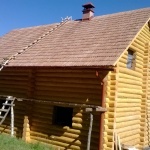 For over than 10 years we build wooden bath houses. 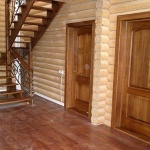 We also build summer houses and make house insulation. Our company pays attention to the right treatment and the storage conditions of all the materials. You can always get a professional consultation concerning all building questions, materials and the project itself. Your own bath house is a unique possibility to have a rest with your family, relax and helps to stay in tonus. Contact us and we will help you to build a bath house of your dream.